Find a cache on every page of the Iowa Atlas & Gazetteer. 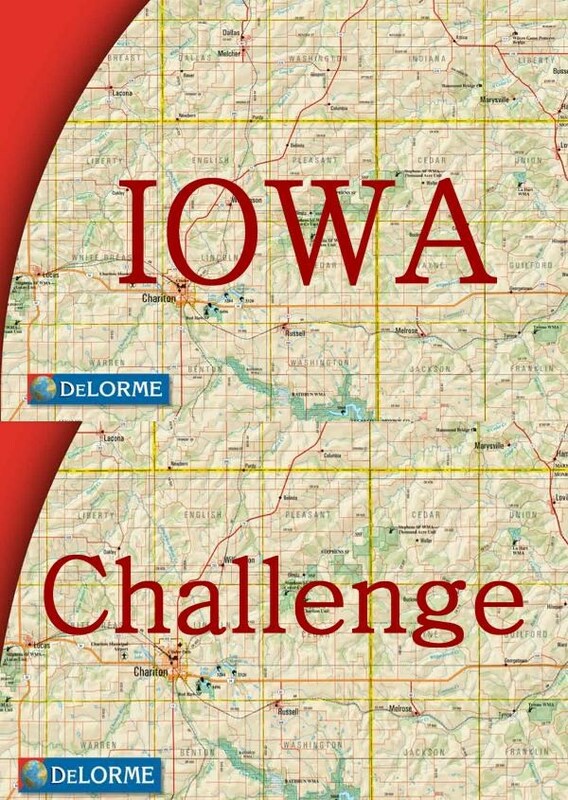 Welcome to the Iowa DeLorme Challenge! To log this cache, you must find a cache on every map page of the Iowa DeLorme Atlas & Gazetteer (pages 14-64, 51 maps). This atlas can be found at bookstores, gas stations, your local library, in internet stores, and many other places. Once you've fulfilled the requirements and I've verified your finds, I will email you the coordinates for the cache, which is located somewhere in east central Iowa. The cache is not at the above coordinates! There is no reason to go to the above coordinates. The best way to do this will be to send me a GPX file containing all your finds, filtering out finds in other states, ineligible caches, etc. The easier the information is to verify the quicker your 'find' can be validated. If you have trouble reaching me by email, you can also use the personal message feature on the geocaching.com forums, or the iowageocachers.org forums. 1. Generally accepted rules, guidelines and conditions for logging a find apply. These must be physical caches with a container and a logbook (no virtuals, locationless, webcam, event caches, etc.) that you have personally found and logged. 2. This DeLorme Challenge will require that finds be in state of Iowa, and that they be finds (hides will not count). Please note, replacing someones cache with your own and then logging it found would be consider a hide. The idea is to find other people's caches all over the state, not hide your own. 2B. If possible create a "bookmark" with the 51 qualifying caches, then run a Pocket Query to create a GPX file. This is the 'proof' you have completed the challenge. Automated maps and lists from the various stats generators are not required. If you can not create a bookmark, please create a list in some other format and email it to me. 3. If a page includes area not in Iowa, only caches found in the Iowa portion will count. 4. Insets: There is only one inset in the Iowa edition of the DeLorme Atlas, it is on page 55. It shows clinton and the far east tip of Iowa on the same page as the Quad cities. A find in either area for be considered a find for that page. 5. You may either do the challenge as 'TrailBlazer' or as 'Heritage'. Heritage means you may include caches found prior to the creation of the Iowa Challenge, as long as they meet all other Challenge requirements. TrailBlazer means you will only include caches found since the creation of the Iowa Challenge (that would be on or after January 29th, 2007). 6. If a cache is exactly on the line between pages, you may count it for one page or the other, but not both. 7. The page boundaries probably stay pretty much the same from edition to edition of the atlas, but for points of reference the Iowa 3rd edition (ISBN 0-89933336-2) will be considered the final guide. 8. You may have others with you when you find the final cache, but only those who have fulfilled ALL criteria for this cache will be allowed to log it as a Find. Any "Found it" logs by cachers who have not had their finds verified, and have signed the logbook will be deleted. 9. If you have any questions, please ask! I will add a FAQ to this description if common questions come in. 10. Remember - this is all for fun and enjoying new parts of the state! Even after someone finds the final, the Challenge isn't over. The final will be available for everyone else who completes all the pages. Finding the final cache is just a little bonus. The real reward is discovering new areas of the state to which you've never traveled. Good luck to all! "Downloading files from the internet is not always safe and you download the file(s) at your own risk." Ricann uploaded some routes to Geocaching.com 'Caches Along a Route' feature (please note to use these you need to be a premium member). There are five of these routes, running east to west, following major roads, threw each tier of pages. Pages 14-24, 24-34, 35-45,46-55, 56-64. If there are many requests for other types of files I will see about adding them. For more on geocaching in Iowa, vist the Iowa Geocachers Organization home page.